Siloam Springs is but 40 miles from Bentonville. We passed on the Wal-Mart Museum and opted instead to visit Alice Walton’s great gift to culture in the South, The Crystal Bridges Museum of American Art. Sam may be spinning in his grave, but his daughter insists that admission to view the permanent collection will remain free of charge. Traveling exhibitions are usually compensated, which means ticket sales, but traveling shows cover a theme in depth. Most are well worth the $10 or so you pay. We first came here four years ago, squirming within the armpit of the dog days of summer. Crystal’s gardens were not then well established and the water feature was infested with algae. The permanent collection was, and is, impressive, and the architecture absolutely sparkles. Ms. Walton has spent lavishly gathering a representative library of works of America’s best painters. Although it is not a deep collection (not a lot of any one artist’s work), it is broad, offering something by just about every big name in American art. She needs to add a Pollock, a Rothko, maybe someone from the Ashcan School, but I hear Wal-Mart pays a decent dividend. Those paintings will come, possibly when next the art market recedes. Meanwhile, enjoy Theodore Robinson, Georgia O’Keeffe, the Peales, Mary Cassatt, Childe Hassam, Frederic Church, Frank Stella, Thomas Moran, and a hundred others. 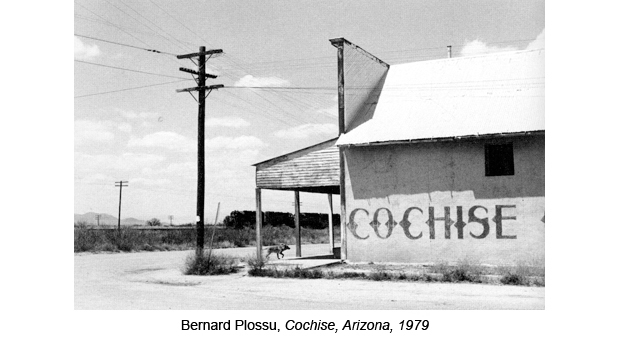 No doubt about it: good art nourishes the soul. If proximity and early spring were not excuse enough for a return visit, its traveling exhibition closed the deal for us. Normally we’re not big fans of camera work as art, but we made an exception for The Open Road: Photography and the American Road Trip. That show captures many of the sights Kat and I have seen, spanning over 50 years of our lives. Haven’t You Been Here or Someplace Like This? 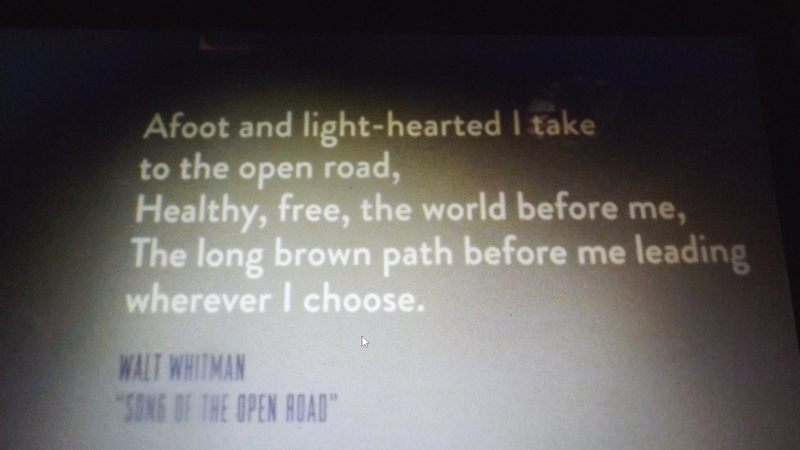 The exhibition opens with a snippet from Walt Whitman’s Song of the Open Road. Who knew old Walt understood full-time RV’ers? Then you will spend a pleasant hour or two viewing maybe 300 photos created by 19 photographers. 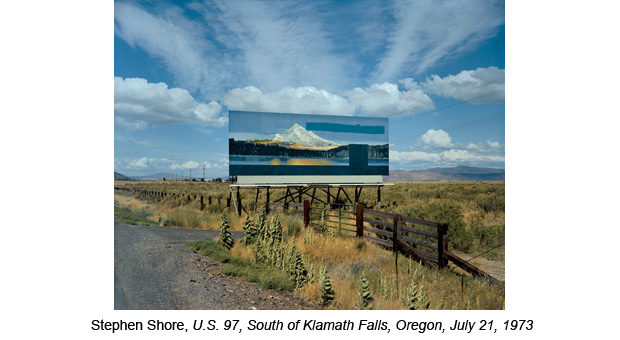 Each in some way refers to a scene captured somewhere in America. Themes include nature, poverty, hate, love, cruelty, kindness, violence, humor, and pain. Much of it is seen from cars. Many shots were taken out of windows or through windshields. Most are real; a few are artistic fabrications. I left sensing we had seen something exceptional. A day later I believe this is something great. How Did the Yellow Line Survive That? There is also a video clip with almost 30 minutes from a handful of American movies. Each portrays some facet of the traveling life. Here’s my favorite, from Easy Rider. The characters are Peter Fonda, Dennis Hopper, and a little-known character actor from the early 70’s whom you may remember, Jack Nicholson. The band is The Holy Modal Rollers. 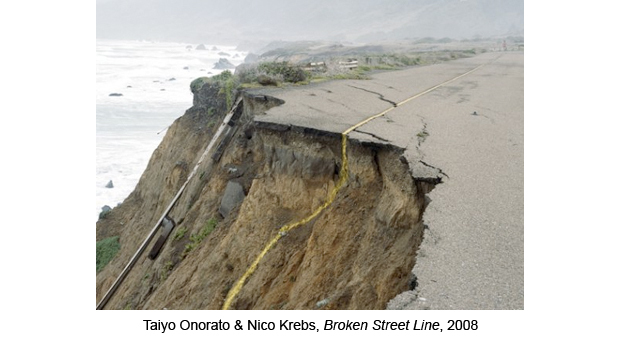 It must be kismet that you and Kat were there to catch the _Open Road: Photography and the American Road Trip_ exhibit. You two could do such an exhibit. Open spaces, open roads. All intoxicating.